Having a window Air Conditioning unit that can not only cool a room but also heat it is ideal for many reasons. There are two types of ways window units can heat a room. Supplemental heating is when a A/C unit uses elements like a space heater to heat a room. The air conditioning components work to cool a room but when heat is needed large elements glow hot from electricity and send out heat. Since the technology is simple these types of A/C window units are cheaper than heat pump units. They are much less efficient than a heat pump. Heat pumps use the same components to heat a home as it does to cool it. 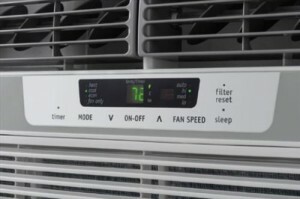 During the summer a A/C unit will push cold air into a room and hot air will be expelled outside. A heat pump reverses this in the winter and will expel cold air outside and hot air inside. The way heat pumps heat and cool is very efficient as cost less to operate than supplemental heating. 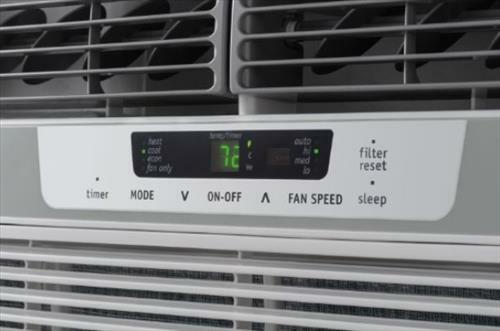 The Frigidaire FFRH0822R1 is a 8000 BTU heat pump unit that uses 115-volt.